[ITALY] The room is a lot smaller than one would think. It’s old; it’s not well lit, humble at best. Still, just walking through the door of that unprepossessing chamber in Ospedale Santo Spirito, near the Vatican, was enough to take Kevin Petti’s breath away. And his reaction had nothing to do with the fact that back in the late 15th century, the smell of unpreserved cadavers would have been pungent. If he has his way, there will be at least one group of tourists coming through every summer from now on, eager to wander through cool rooms filled with wax models of human organs and bodies — with skin peeled away to reveal the mysteries beneath. Why? Well, to hear Petti tell it, Michelangelo’s Pietà couldn’t have existed without late-night forays to Florence’s Church of Santo Spirito, where the then 17-year-old prodigy first explored human dissection in hopes of uncovering the secrets of the body. It’s fascinating stuff, and Petti revels in getting others as excited about the intersection of art and anatomy as he is. Petti is a dapper fast-talker with a neatly trimmed goatee and piercing eyes. 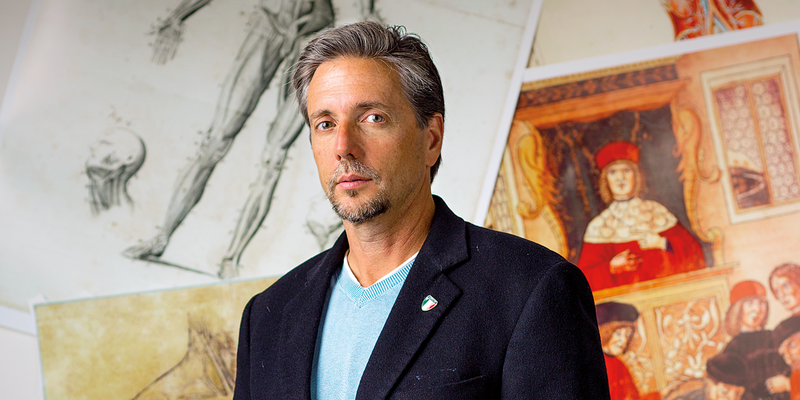 At a summer lecture for life-learners at USD’s University of the Third Age, he offered up a rapid-fire overview of the many culturally significant spots in Italy he’s toured, such as the Luigi Cattaneo Anatomic Wax Museum at the University of Bologna and the University of Padua’s Anatomic Theatre. While of course the delights of Italy’s wine, fresh pasta and historic beauty are legend, can learning about the history of anatomy along the way compare to more mainstream tourist spots? Absolutely, says Petti, who holds dual U.S./Italian citizenship. The notion that seemingly disparate studies are connected is interlaced through the courses he teaches at Miramar as well. “With everything I do, every course I teach, I really emphasize the multicultural, the interdisciplinary aspect. It’s all interconnected.” Petti says that for as long as he can remember, he’s been intensely interested in bodies, in sport and in fitness. He had initially planned to spend his career working with athletes, but once he started teaching, he quickly changed his trajectory. One of the 2012 participants, Peggy LePage, a professor at North Hennepin College in Minnesota, agrees. “It is difficult to describe how we felt standing in the exact spot [da Vinci] stood. In awe only comes close,” she said in a blog post about her experience.